Unfortunately, This isn't something you can cheese like the 2000 Point milestone. Nevertheless, it is quite possible and I'm sure everyone will be playing like a pro in no time if you follow this guide to getting 5000. How to Get 2000 HS (High-Score) Easily. The Road to 50/20 Mode. To start, I'm going to list all the animatronics set to 20 that I used on my successful run. Now lets talk about some variations to the formula. If any of the above animatronics are giving issues for you, you can swap them out interchangeably with Molten Freddy and/or Innard. They both come one after the other with very noticable sound cues to shut the front vent. I find it extremely easy to deal with them, so use them in place of any other 2 that give you more trouble than you'd like. Innard makes a squeaky sound a couple seconds after molten freddy makes a noticable chuckle. 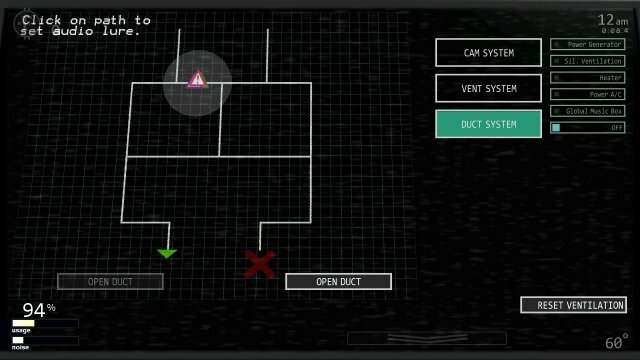 The FNAF 6 trio (Happy Frog, Mr. Hippo, and Pigpatch) are heavily exploitable with the audio lure and can be eliminated for the entire night right at the start. As soon as the night starts, turn on the power generator (press 1), turn off the fan (press space), and go into the Duct System cam. You want to quickly catch the trio with the audio lure. If done correctly, the trio will be out of your way all night and you can focus on more important things. I strongly suggest watching through the 2 longer videos I have on the game as I end up walking through almost every animatronic in this guide. If you'd prefer not to, these tips should get you the general gist of what you should do. Balance between powering the Generator and the AC. Don't bother turning the fan back on, the AC consumes the same amount of power at a greater rate of temperature drop. The more power saved from the generator is more time you can play it safer rather than on reflex later. Visual Cues are most of what you need to look out for. Nightmare Fredbear, Springtrap, and Nightmare all function the same way. If you see them in a doorway, shut it and you'll hear a metal knocking. That means you can open the door/vent and they're gone. BB and JJ appear in the bottom right vent interchangeably. just press F to close it and the same metal knock should indicate they're gone. Try practicing with just the non lethal animatronics and one lethal to get a feel for how they can make you screw up. While Mangle cannot kill you, he/she can create an annoying audio distubance that could distract you from real threats. Use the vent snare to stop him/her. Lights flickering and static means Toy Bonnie or Toy Chica is moving across the screen, put on the mask until they stop moving towards the center. You can take it off afterwards. Withered Bonnie functions almost the same, but I scarcly encountered him at all. Use mask to fool him if he appears. Its imperative that you don't let JJ in the room, since many of the lethal animatronics are stopped by doors.